Gordon Stevenson was an artist, musician, and filmmaker. Following a move to New York in the late 70s, he married Mirielle Cervenka, also known as “Spike” (older sister of Exene Cervenka of the band X), and became the bass player for Teenage Jesus and the Jerks, one of several No Wave bands featured on the influential album No New York. 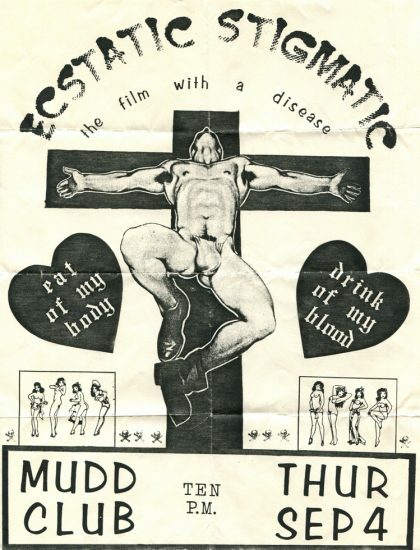 Stevenson also directed “Ecstatic Stigmatic,” the film with a disease in 1980, which was presciently named just on the brink of the first reported cases of AIDS. Stevenson died in the early 80s, one of the East Village art community’s first casualties of the AIDS epidemic. His brother, Davey Stevenson, who was the bass player in the early 1980s Athens, Georgia band Limbo District, also died of AIDS in the early 1990s. Actress Cookie Mueller wrote about Gordon Stevenson and quotes a personal letter from him written during his illness in Walking Through Clear Water in a Pool Painted Black, published by Semiotext(e) after her death, also from AIDS, in 1989.